When choosing the perfect e-commerce platform for your online business, there are certain things that you need to consider. The foremost concern is to select a platform that you will be using for creating an e-commerce website. Out of all the available options, here are the two best open-source platforms we plan to discuss about – WooCommerce and Magento. Both these contrasting platforms have managed to create a ripple in the market through their vast functionality and usability. What comes out as a tricky situation is choosing one out of the two available platforms as making a wrong choice can affect your business greatly. To make your task easy, we have sidelined few differences between WooCommerce & Magento. In case of Magento, the list of server requirements is a bit longer. It is important for you to have certain technical knowledge to avoid any sort of lapse in the setup. Considering the complexity in Magento, the system requires comparatively more server power and disk space. Installation of Magento requires you to do some homework. Magento installations on budget servers become annoyingly slow, which is why you need to rely upon a high-performance hosting provider. Considering the ease of use, WooCommerce is a leg-up than Magento, but this is only in case the users are comparatively less sophisticated. However, Magento is a more flexible and powerful platform for all the sophisticated clients selling operating at enterprise level. WooCommerce is free initially, but has some features that get paid with time. However, overall WooCommerce offers affordable hosting with less expensive plug-ins, and most importantly least development costs. Considering the affordability factor, WooCommerce seems very efficient until you start realizing that there are certain bits and pieces that are missing. Magento’s Community Edition is free to download, hence putting it in the same queue as WooCommerce. However, for bigger businesses, the functionality is a bit restricted. The solution is Magento Enterprise, which has been designed specifically keeping in mind the requirements of large scale online businesses. The overall cost can escalate owing to the costly extensions, significantly high development costs and expensive server requirements. Magento is best suited for handling the medium & large businesses. It is a quite difficult to run a portal with thousands of products and hefty plug-ins while using WooCommerce. Despite being a bit expensive, Magento is highly capable to manage Ecommerce portals while offering long-term flexibility, an impressive suite of features and scope for growth. In contrast, WooCommerce has limited scope and restricted in terms of features. This is probably, the reason why Magento dominates the Ecommerce world. 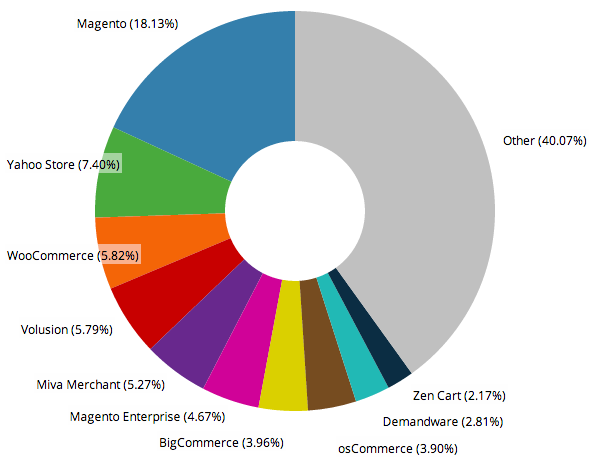 Having a look at the pie-chart below, it could be seen how maximum businesses are getting best bang for their bucks with Magento.